Dennis Highlands is the perfect start to your golf vacation. The Highlands tends to be more forgiving off the tee, but don’t get too comfortable around the greens as the large rolling terrain requires all of your focus and concentration. The staff at the Highlands takes great pride in providing all guests with a championship golf course that is always immaculately maintained and customer service that rivals any private facility. Dennis Pines will flat out test your skill. The Pines has four sets of tees that can accommodate any golfer, but the Championship tees at 7,029 yards will provide the most accomplished player a true test of golf. The 10th, 11th & 12th holes are the Cape’s version of “Amen Corner”, making or breaking a great round. Since 1965, Dennis Pines has, and will continue to be a favorite stop of golfers of all abilities. Dennis Pines: Take exit 9B off of Rt. 6, proceed north on Rt. 134, take a right approximately 2.5 miles to Golf Course Road, Dennis Pines Golf Course is located at the end of Golf Course Road. golfers should leave the course immediately or seek shelter. Dennis Highlands: Take Exit 9B off of Rt. 6, proceed north 1/2 mile to the first stop light and take a left on Bob Crowell Road. Travel to the end of Bob Crowell Road and take a right on Old Bass River Rd., proceed on Old Bass River Road for approximately 2.4 miles, entrance to the golf course will be on your on left. 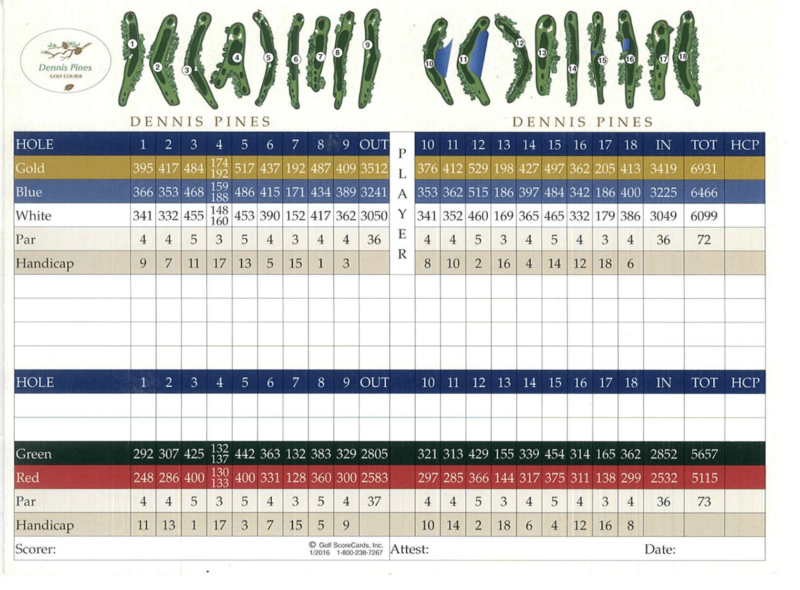 Dennis Highlands is a par 71, sixty five hundred-yard championship golf course. It is situated on 175 acres of pine and oak covered rolling ground on the north side of Dennis, in the village of Dennis. Designed by Jack Kidwell and Mike Hurdzan and opened for play in 1984. Dennis Highlands may be the “Crown Jewel” in the traditional list of fine Cape Cod golf courses. It is a course marked by an impressive entranceway among wild flowers and trees, leading to a beautiful clubhouse. It boasts one of the most spectacular practice ranges in golf and culminates in eighteen of the most visual and enjoyable golf holes in sequence anywhere. Warning: Our club has NO lightning detection system. In the event of inclement weather, golfers should leave the course immediately or seek shelter.